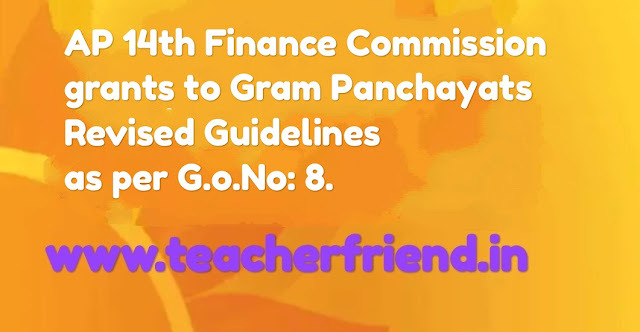 Home» Ap new gos » AP 14th Finance Commission grants to Gram Panchayats Revised Guidelines as per G.o.No: 8. AP 14th Finance Commission grants to Gram Panchayats Revised Guidelines as per G.o.No: 8. AP Fourteenth Finance Commission (FFC) grants to Gram Panchayats Revised Guidelines for release of Performance Grant for the period from 2017-18 to 2019-20 Amendment to G.O.Ms.No.3,PR & RD (PTS. II) Department, Dt:18.01.2016 as per Go.MS.No. 8 Dated: 29-01-2018. G.O.Ms.No.3, PR&RD (PTS. II) Department, Dt. 18.01.2016. Letter No.N-11011/4/2017- FD, Dt.29.09.2017 of the Additional Secretary, Ministry of Panchatyat Raj, Government of India, New Delhi, Dt.06.12.2017. From the CPR&RD, A.P, Vijayawada, Lr.No.2878/CPR&RD/2015 , Dt.09.01.2018. The evaluation of those GPs who have satisfied all the four criteria shown in Rule 7 above will be carried out as per the scoring system.